In an unnamed high fantasy setting, humans and other sentient races have set their eyes on the New World, a separate continent from the populated Old World. The New World is an untamed wilderness where many powerful monsters roam, and where researchers have been drawn to uncover new mysteries. Several ocean-bound Fleets have been sent already to establish working bases, safe from monsters, and operations are led by the Research Commission. An A-list hunter named Aedan, supported by an assistant handler, who are a part of the Fifth Fleet which has been summoned by the Research Commission to provide more support to the New World. 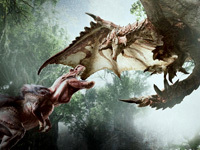 A particular focus of the Expedition is to study Elder Dragons, powerful beasts that can affect entire ecosystems, and why they migrate to the New World every ten years in an event known as the Elder Crossing. While traveling to the New World, the Fifth Fleet encounters Zorah Magdaros, a massive Elder Dragon the size of a mountain. After being rescued and arriving at the base camp, known as Astera, the Hunter and their Handler undertake various tasks to explore the area and study Zorah Magdaros at the behest of the Commander of the Expedition.